At Bulk Apothecary you can find high-quality helichrysum oil at an affordable price so you can immediately start using it to experience some of its well-known benefits. This essential oil is steam distilled from the helichrysum plant and is used by aromatherapists for a variety of uses. We are committed to providing the pure oils you want so you can take advantage of all its beneficial characteristics. Aromatherapy oils, citric acid where to buy these items and more. If you are looking for a new supplier of all your soap making needs, give us a chance. We offer amazing wholesale prices, great customer service and an amazing selection of your favorite products like citric acid, glycerin and other great wholesale soap making supplies. This is a must have essential oil for minor trauma, sprains, bruises, or injury, I.e. Bump of the head or over bony areas, such as the shin or toes. One to two drops can stimulate your bodies healing and reduce bruising and sprain healing time. Assists with mental clarity too. I find it indispensable in my practice as an Integrative Health doctor. Always honor the plant spirit source. Instantly I could tell this is a high quality oil. I added some to my massage blend because I read that helps aid cellular repair, fibromyalgia, and depression. I love the scent, it's a nice addition to the blend. Definitely worth its price. It would sell better if offered in smaller amounts. I have to buy it in smaller amounts because of the price. So, I end up having to buy it from other sources. This oil is amazing! I use a drop in the morning and another in the evening on my face with carrot seed oil. I no longer use any other skincare products, including moisturizers. My skin looks younger and I have noticed that my wrinkles are virtually non-existent. My skin's usually been quite oily, not any more. I spent the $1585 for the largest bottle. Its nice. It was a little thinned out for what I was expecting. I didn't know what to expect honestly. I am getting used to the scent. Its nice. I put some of the oil on cuts and bites with some improvement. My 2 yr old Son got hit in the mouth with a swing at the park and his tooth went through his lip ironically the day before I got the oil. I was able to use it . It seemed to lessen the redness and faded it to pink within a few days. I was expecting an overnight miracle for the price. I read too many online reviews that made miraculous claims. The key is patience. It works well, just slowly. So make sure if you have just read about the oil it can sound too good to be true... understand though that it does not have huge effects immediately but with consistent use it does work well for healing the body, it is a valuable product. I USED HELICRYSUM IN MY HEALING CREAM FOR SKIN BEGINNING CANCER CAUSED BY THE SUN. IT CLEARED IT UP IN JUST A WEEK. MY FRIEND WAS A MESS ON HER ARMS. NOW SHE CAN WEAR SHORT SLEEVES AGAIN. 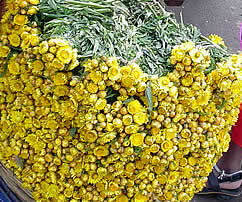 Helicrysum is worth twice its weight in gold.